View My dream trip around half the world on ZK_15's travel map. After walking for so many hours in Buenos Aires, Argentina, there’s no better way to relax than on the Copacabana beach in Rio de Janeiro, Brazil. A friend of ours suggested that we look for an apartment on airbnb, instead of going to a hotel, so that’s what we did. We have landed here a few hours ago and after checking in at the apartment where we will be staying for the next couple of days, we came down to the beach for a swim. On the beach, there are a lot of locals trying to sell many different things, so it definitely won’t be a problem if a tourist forgot their towels, etc… However, it can get quite pricey. We have bought a coconut and shared it. It tasted really sweet and it was one of the best! The people with whom we are staying with are very nice and helpful. Since we don’t speak Portuguese, it is quite tough to understand when others are talking to us. They have lived in the USA, so they know English. Guess we can say that we got lucky! They also offered to show us around. Since it is currently winter in Brazil, there is a lot of rain. They brought us to Ipanema, which is one of the safest parts of town. There are a lot of people at Ipanema beach, but we decided to not go to the beach, instead we just walked around. We went to the craft fair. There were many locals selling hand-made crafts. We got the chance to buy some souvenirs. 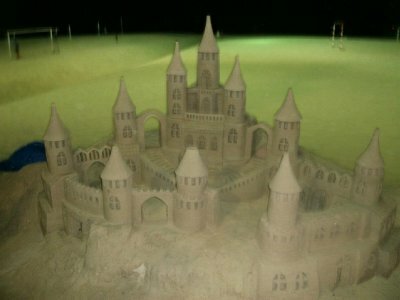 We also saw a really big sand castle. For our first day in Brazil, it is quite busy. We are doing so much and we are tired. 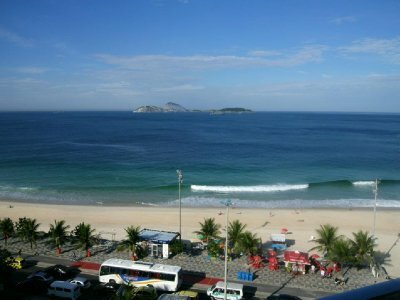 But it's okay, because Rio de Janeiro is definetely one of the most beautiful cities that we've been to. We also want to see the most that we can. 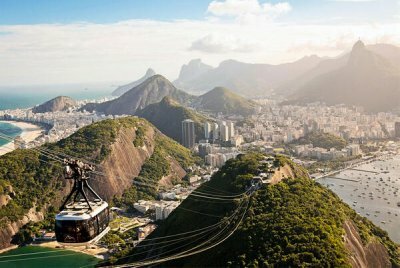 Brazil is the largest country in South America and Rio is one city of the country, yet there is already so much. I think that if we wanted to see all of Brazil, it would take us at least a year. What I like about the country though, is that there is so much to see and there's something for everyone. Like there's the Amazon Rainforest, museums, parks, art galleries, etc. Our next stop was the Christ the Redeemer statue. It is actually one of the seven wonders of the world and is seen in many movies. I was amazed when I learned that the statue was sculpted in France. 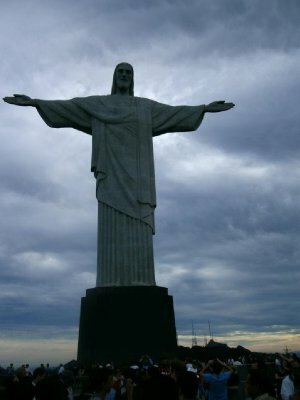 It is located on the Corcovado Mountain, which we had to take a train to get to. The view from it was absolutely breathtaking though. Afterwards, we had lunch at a local restaurant and tried fresh watermelon juice. Then, we went to the Tijuca Forest. It is one of the largest urban forests and surrounded by it, there is another tourist attraction which we visited, the Park Lage or el parque lage. Our second day in Rio was quite relaxing. The owners made us breakfast; hot chocolate, bread with butter, biscuits, fruits (papayas, pineapples and passionfruit-fun fact: passionfruits were first grown in Brazil). There's only one hour difference from Canada and Rio, so we talked to our parents before heading out, so that they know we're okay. The owner's husband, Fernando, had to go to work so she, Giselli, took us to Sugar Loaf Mountain. We took a cable car to get at the top of the mountain. It looks like the traditional sugar that was used back then. We got the chance to go rock climbing there. It is a very popular landmark to do this kind of thing and one of the largest in the world. Being the kind of person who is scared of heights, I sure did a great job with the help of Giselli and my sister. She then drove us to Iguazu falls, which is located on the Brazil and Argentina border. 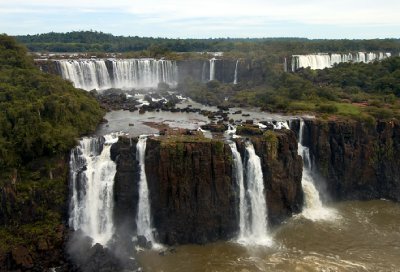 It is on the Iguazu River, which is divided by the lower and upper section. It is also another one of the UNESCO Heritage Sites and it is both taller and wider than Niagara Falls. We also went paragliding once we got back to Rio. It was an amazing, yet scary experience. I felt like a bird and we also got the chance to see Rio from a bird's point of view, so it was pretty cool. 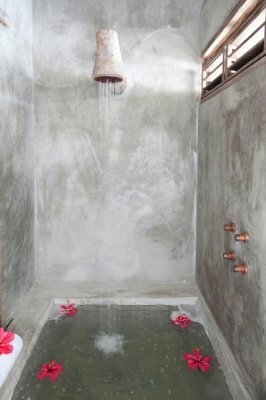 She also told us about this place about 14 hours drive north called Casa Lola, where the "shower in the guest cottage has a wooden shower head made from a fallen tree, and copper faucet knobs made by local artisans." She showed us a picture from when she went and we were amazed by how sick it looked, but we don't have enough time to go visit it. It looks like a beautiful hotel. Instead, the owner surprised us by taking us to a football game at the Maracanã Stadium, which is where the next FIFA World Cup is set to take place. What is known as soccer in North America and football in South America, this worldwide famous sport is very popular in Brazil. People are crazy about the sport and it is seen as almost like a religion, because so many people love it. A lot of people in Brazil are poor, so this is seen as a form of entertainment, where the nation comes together. Fernando also joined us for the game since it was right after dinner. The stadium was packed and we got Brazil jerseys to wear at the match. He was also telling us about a very famous 4-day celebration which occurs every year in Rio. It is known as Carnaval. There is a huge Samba parade and the show is broadcasted worldwide. We couldn't attend though, because it starts on Saturday and ends on Fat Tuesday. It is the biggest carnival celebration that occurs forty days before Easter, so we were way off. It's okay though, because we got to experience what a soccer game feels like in Rio! On our final day in Rio, we decided to relax some more, by just going to the local beach -Leblon Beach.